An Alien from Outer Space is Curious About Us ... Who or What Should We Turn It Onto? Have you learned from Shakespeare? Billie Holiday? Cézanne? Meryl Streep? Most of us can name a book, song, or poem that moves us. A painting or photograph that stops us in our tracks. A long-gone performer for whom we’d gladly step into a time machine to see. But an artist who tells us something important that we never knew—who fundamentally changes us—is rare. In advance of the Zócalo/Getty event “Do the Arts Make Us Better People?” we asked some creative people to consider the following scenario: An alien from a faraway galaxy has traveled here to learn about the human condition. You can give this extraterrestrial being the name of one artist of any genre to study and learn from. Who do you choose and why? I would invite our alien visitor to listen—in their entirety—to the bookends of Muddy Waters’ career: the early 1940s Library of Congress plantation recordings and the final trio of Johnny Winter-produced LPs that earned Muddy his only Grammy award. From this raw and powerful American master, the extraterrestrial would learn of the peculiar human experience that we call the blues. Through Muddy’s music, he/she/it would know of human suffering and survival, from Abraham through Afghanistan. Without having to read a single book, the “other” would know the passion of Christ and the passion of Cleopatra, of spare parts and broken hearts. I once wore a beat-up blues T-shirt (bleach-stained and torn) while interviewing an aged rabbi in Baltimore who had survived the Holocaust and lost his entire family. I answered that it was the music of slaves who sang out in their torture and their labors to make it through another day. Rafael Alvarez, a former staff writer for The Wire, is a short story writer based in Baltimore. His latest collection is Tales From the Holy Land, released in 2014 by Perpetual Motion Machine Publishing. He can be reached via orlo.leini@gmail.com. I’m going to make this easy on the little green guys and refer them to the Modernist architect John Lautner. Bob Hope once said of the house that Lautner built for him in Palm Springs, “At least when they come down from Mars, they’ll know where to go.” The concrete and glass structure looks like an elegant and massive spaceship—as do many of the midcentury masterpieces the architect built for wealthy Californians, such as the Chemosphere, a flying saucer house wedged into the side of a Hollywood hill. The space aliens will feel right at home as they cuddle up on the cast concrete couch of the Sheats-Goldstein residence and look out through the air wall across the L.A. basin—just like the Dude does in The Big Lebowski. But there’s more than just imagineering at play in Lautner’s space-age bachelor pads. One of Frank Lloyd Wright’s best students, the late architect didn’t so much fuse indoor and outdoor spaces (a signature of L.A. design) as treat them as one, blowing up our conception of shelter. Brothers from another planet would find in Lautner’s creations a vision of how man can live with nature—a point of view they might find sorely lacking elsewhere on Earth. And if they’re looking to colonize, well, the asking price for the Hope house just dropped to a mere $34 million. Evelyn McDonnell’s latest book is Queens of Noise: The Real Story of the Runaways. She’s the acting director of the journalism program at Loyola Marymount University and lives in San Pedro. For an extraterrestrial visitor, a good primer would be Octavia E. Butler, a science fiction writer who examines the unforeseen complexities that might bedevil a first encounter between two species. Science fiction has tended to populate the future with—how shall I put this?—a somewhat restricted palette, and gender roles that seem more archaic than futuristic. Butler does more than just fill in these glaring omissions. She creates multi-faceted characters—not unlike herself—who might in other circumstances be ordinary (and perhaps even unnoticed) but who overcome their own limitations to confront the extraordinary. In 1998, the Los Angeles Times quoted Butler as saying, “I’m black. I’m solitary. I’ve always been an outsider.” She was also dyslexic and inordinately shy. Early in her writing career, she supported herself with a series of mundane jobs, including a stint as a potato chip inspector. Who better to write about surviving dystopian futures? It’s difficult to choose from her works, but in this particular case, I would offer up the Xenogenesis Trilogy, also known as Lilith’s Brood, which consists of the novels Dawn (1987), Adulthood Rites (1988), and Imago (1989). I can’t think of another writer who has drawn so deeply from humanity’s nastier histories to grapple with encountering the inconceivably alien in such an extensive and challenging way. Extraterrestrial readers would not only learn much from Octavia Butler about human terrors and strengths—a full spectrum of what it means to be human—but they might also unexpectedly discover a fully realized and empathetic portrait of themselves. Allan deSouza is an artist based in San Francisco, and a professor in the department of art practices at UC Berkeley. *Lead image: Malin House ("Chemosphere"), 1960, designed by John Lautner. Photo by Julius Shulman, 1961. 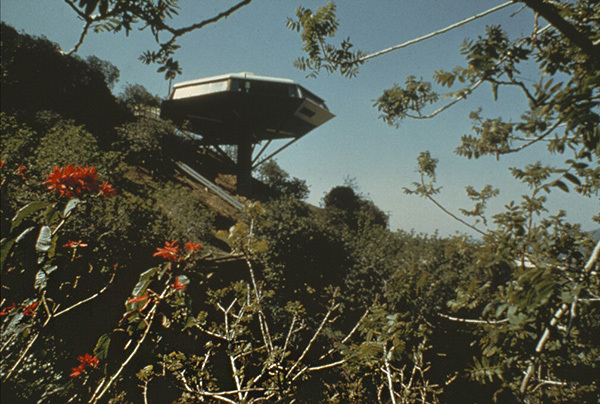 Julius Shulman Photography Archive, Research Library at the Getty Research Institute (2004.R.10). © J. Paul Getty Trust. Used with permission. Photo of Rafael Alvarez: Mark V. Lord. Photo of Evelyn McDonnell: Tim Maxeiner.